Glee Quote of the Week – S01x21 – Funk | personal.amy-wong.com - A Blog by Amy Wong. Funk felt so… SO inappropriate to watch. I wanna say I loved it, but I will need a second view. I mean… I always knew Finn and Will were alike… and that the way for love is PURE HATE. Also, watching pregnant un-wedded mothers shaking their money-makers to It’s a Man’s World, I just kept waiting for a baby to fly towards the camera. Anyway~~~ next week is the season finale! Sue: You know, for me trophies are like herpes, you can try to get rid off them, but they just keep coming. You know why? 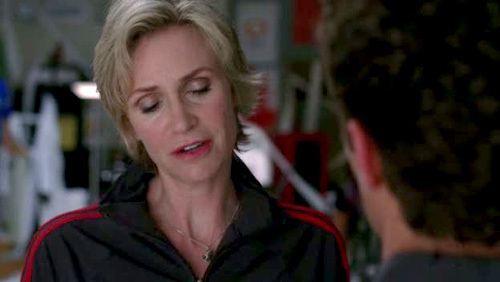 Sue Sylvester has hourly flare-ups and burning, itchy, highly-contagious talent. HAHAHA!! Epic quote by Sue Sylvester once again! !